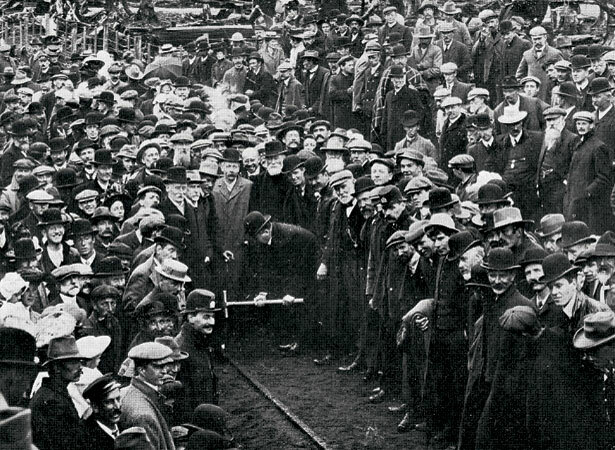 Prime Minister Sir Joseph Ward ceremonially opened the North Island main trunk railway line by driving home a final polished silver spike at Manganuioteao, between National Park and Ohākune. According to a reporter who accompanied Ward from Wellington, the ceremony was ‘as impressive as scowling weather, muddy embankments and interfering photographers would permit’. Construction of the central section between Te Awamutu and Marton had taken 23 years of surveys, land negotiations, political wrangling and back-breaking physical effort by thousands of labourers. The first through train from Wellington to Auckland had actually run two months before the final spike ceremony when a ‘Parliament Special’ train carried MPs and others north to meet the US Navy’s visiting ‘Great White Fleet’ (see 9 August). This train had crawled over a temporary section of track hastily laid between the existing railheads. Regular services between Auckland and Wellington began soon after the last spike ceremony, and an express service introduced in February 1909 made the journey in 18 hours. From 1924, a new ‘Night Limited’ service cut the trip to 14 hours. We have 1 biography, 8 articles, related to Last spike completes North Island main trunk railway .